My laptop is waiting for some new parts to arrive today, so in the mean time I have booted up the ol' dinosaur computer to see if it can handle a blog post. The old machine is from 2003, and still very capable of holding files and spreadsheets of data I prepare for the tax man. However, loading websites full of graphics or more? That doesn't go so well. I wasn't sure I would even be able to upload a picture, but that bridge has been crossed so I am going to inch forward very carefully to share these Red Velvet Sandwich Cookies with you. When I shared last weeks White Chocolate Dipped Cherry Cookies with you, I had a lot of requests for the cookie that Truckin' Man was requesting. Well, this is it! 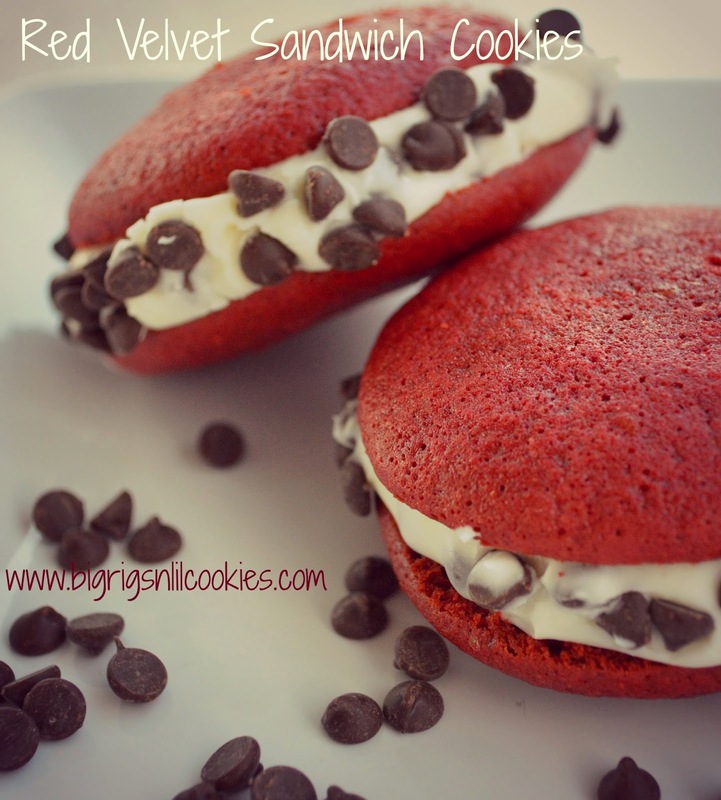 Red Velvet Sandwich Cookies! This was my first time making anything Red Velvet, and I will definitely be trying more. You know how some times things just fall into place when you are supposed to do something? That definitely happened on this recipe. Just last week I had learned of a new company called LorAnn that makes oils and flavors for baking, candy, etc. I first read about them over at Baking in Pyjamas, I thought they sounded wonderful! Laura is based in London though, so I really didn't give these to much more of my thoughts. Well.... two days later I was shopping in a store that isn't a normal stop for me, but I was looking for something for another friend who lives in the UK, and I found several LorAnn products... One of which was a Red Velvet Bakery Emulsion. Sold! I had to try these products! These sandwich cookies are wonderful, Truckin' Man loved them. I have been watching what I eat pretty carefully lately, so I only had two of them. I will tell you though, he is lucky I didn't lick the frosting out of each one of these when he wasn't looking! Preheat oven to 375 degrees. Line baking sheets with parchment paper, set aside. In large mixing bowl, cream butter and sugar, until light and fluffy. Add eggs, one at a time, mixing until fully incorporated. Stir in buttermilk, apple cider vinegar, vanilla, and Red Velvet Bakery Emulsion mixing until combined. In another bowl combine flour, cocoa, baking powder, baking soda, and salt. Add dry ingredients to butter mixture, stir until completely combined. Using small cookie dough scoop, drop dough onto lined cookie sheets, about 2 inches apart. Bake for 10 to 12 minutes, or until done. Cool for 3 minutes on cookie sheet, then transfer to cooling rack and allow to cool completely. While cookies are cooling, in large mixing bowl add cream cheese, butter, sour cream and vanilla. Mix until smooth and creamy. Slowly add powdered sugar, mixing until desired consistency for spreading. Add more powdered sugar as needed, if you want it thicker. Add one cup of mini chocolate chips. Stir until evenly mixed through frosting. When cookies are completely cooled, add remaining chocolate chips to shallow bowl. Spread frosting on one cookie, and top with another cookie. Roll sandwich in chocolate chips. Recommend: Allow cookies to set for a couple hours for the frosting to set. Otherwise be ready to lick up a bunch of frosting! Yummy...oh my!! What an amazing treat. Well done and as always, THANK YOU for sharing. Perfect cookies for Valentine's! They look delicious! Yum oh Yum! These look perfect for Valentine's Day! So glad you shared with us at Weekend Potluck. These look beyond yummy! Thank you so much for sharing! I haven't done much in terms of valentine treats this year but maybe I will pull some out to post since it is upon us! Hope you to enjoy these delicious treats and have a great day tomorrow! I see that you made some Red Velvet cookies! These look so delicious! I am so glad trucker man loved them! We live in your neck of the woods, would you share where you bought the Lor Ann product?? The cookies look amazing!! Chris, I found it at Hobby Lobby in La Crosse. Is that near you? Fun store, I need to shop there more often! We are in Sauk Prairie, so we do the 2 Hob Lobs in Madison. I will look the next time I go!!! They are great for any time, but just perfect for V-day! What a perfect treat for Valentine's Day! i was thinking that if i had the wherewithal to make a valentine's day treat, red velvet whoopie pies would be a great idea! kudos to you--they look perfect! Oh boy, these are amazing! I love red velvet cake so these look like the perfect treats to me!